Length: For width upto 5 cms can be made in 2 - 3 meters.For other widths, length can be one meter. Leather woven belts have a unique intricate pattern throughout reassembling a woven net and actually look very different. It has a buckle that is made of stainless steel hence is rust free and can be easily adjusted in the belt holes thus making it comfortable to wear. This belt is very stylish and an ideal choice for females who are fashion conscious. Quality being the major concern of our organization, we keep a stringent check on the production, packaging and delivery processes. Founded in Agra(India), our company has been successful in capturing the local and domestic markets as trader of this product. Owing to devoted experts, we have been competent to present a wide range of Black Leather Belt. These products are made as per industry norms and standards. 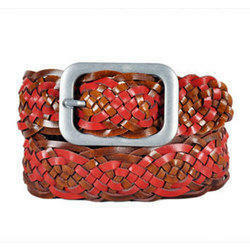 We are engaged in exporting a wide variety of products like woven leather belts.